Moment of victory. After 31 hours, my hand is on the sub and Erin's is on my face. We won. Not I, we. I semi-jokingly told Erin throughout the Year of the Pizza that she should compete alongside me in the 2009 Hands on an Eggplants Sub contest to increase our household’s chances of winning. I did my part to keep our bellies full and fat, she should do hers as well. She thought it would be fun in our twisted sense of the word, and so she stood by my side for 30.5 hours (which I’ll round up to 31 because it sounds cooler) as we watched the eight other HOES fall one by one. When she took her hand off to let me win, it was an act of love. While some media outlets are understandably characterizing this as my victory, I really feel that it should be our victory. Erin and I both know that she could have outlasted me, but that would not have been healthy for our bodies or our relationship. So after 31 hours, we won. The field of ten was pretty intense. Last year I only faced three other competitors, and won in 7.5 hours after Sonia accidentally took her hand off the sub. This year there were ten of us, and I knew that even if a couple folks dropped off, there would still be a substantial crowd for many hours. Erin and I were more prepared than most. We had layers of warm clothes, logo’d stress mats to stand on, sleeping bags to huddle in and had dehydrated bodies. As time dragged on these all paid off big. To pump up myself and my friends, I made t-shirts based on the Rocky theme, and I came to the contest in Rocky-esque grey sweats, a black wool cap, and my logo emblazoned on the stress mats. My posse and I rolled up to Homeslice playing the Rocky theme song, but some technical difficulties made the show seem unimpressive. I don’t think people got the whole Rocky thing because I had a jacket and/or sleeping bag over the hoodie most of the time and my friends covered up their shirts with their jackets. I had been very nervous about lasting ten hours without peeing. All week I had practiced and never made it beyond nine hours. At around six hours the urge came on strong, and I could only hold it in for two or three hours. I even went to an acupuncturist a few days before to help strengthen my kidneys, since not drinking much over a week and eating lots of salty pizzas could not possibly have been good for my health. For whatever reason, game day was a different story. I didn’t drink anything before the competition started, and I found that I could go nine hours easily, and began drinking at that point just to give my body some hydration before the ten hour break. Once everyone got to know each other, hanging out on the sub was actually fun. It’s hard to believe considering the lack of bathroom breaks, temperatures in the 30’s-40’s and general body deprivation, but a peculiar goofiness took over at times. The first day was fun because of the carnival zaniness which we were a part of, but the night was more cold and lonely. People waiting for a table did so inside, so we had fewer people to talk with to alleviate the boredom. One thing that wasn’t so boring was the drunk driver that almost hit us. We were standing on the sidewalk, cordoned off by velvet ropes and wooden signs, but some drunk jerk in a white SUV (license plate TWF439) zoomed up on the sidewalk and only stopped after knocking over the ropes and signs, coming within a foot or two of hitting Giselle, one of the coolest competitors. None of us took our hands off the sub though! Someone’s boyfriend went up to the guy to tell him off, but he drove away while yelling that we were “Nazi assholes”. We called the cops. Once Homeslice closed, the staff came outside to nominally judge us, but they mostly chilled with themselves, only coming over to pseudo heckle us or chit chat for a couple of minutes here and there. It was hard watching them drink wine, sit down and dance around while we were stuck shivering on a sub. Once they left, things got cold, lonely and tiring. The hours between 4-8am were particularly bleak. 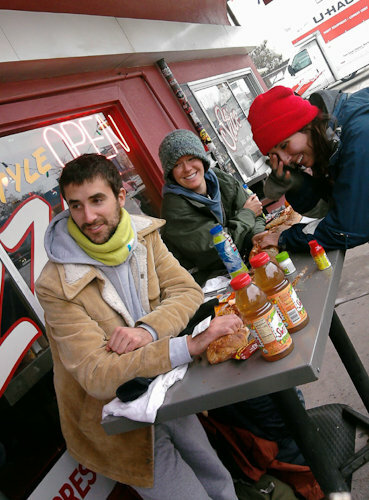 Terri, one of Homeslice’s owners, pulled the 6-9am graveyard shift and hung out with us. Another example of the awesomeness of Homeslice. Once the Homeslice staff started dragging themselves into work around 10 or 11am, we perked up. Sunday was oddly relaxed. Our muscles and joints had become somewhat numb to the pain and the cold, and all of us had friends come by to support us with food, drinks and encouragement. My posse was particularly awesome. Michelle Engels drove down from Dallas to support me. Anneliese and Colin kept the tip jar enticing, brought me ipods and such, and with Michelle, sat in solidarity with me. Ryan, Jessie and Sabrina came by and brought friends to keep us company. Billy brought energy drinks at 7am and his laptop so I could keep on with my Godfather trilogy. Johann kept me pumped up with his Karate Kid theme song-and-dance routine. Lots of my food blogger friends came by to chat, bring cookies and encourage us. My phone nearly melted with the constant torrent of supportive texts and tweets. The daytime crowd kept asking the same incredulous questions. You’ve been here for how long? Bathroom breaks every ten hours? Only five minutes each? Aren’t you cold/tired/crazy? While it was a little repetitive, the more we amazed people the more $$$ they tipped us, with all tips going to the next person out as a bribe/consolation. Erin thought there was some sexism in the air. People asked me and another guy who was going to win, but didn’t ask the girls. Most questions overall were directed at the males, which is too bad. I don’t know why people assumed a guy would win, I think females have a higher threshold of pain and putting-up-with-crap-itude. Around 5pm, one of the brashest talkers accidentally took his hand off while futzing with his shoe. That left Erin and I with one other competitor who had an exam the next day at 12:30pm. After the third bathroom break at 7:45pm, Erin and I decided to try to end it. We had outlasted seven of eight competitors. and Tiffany had little chance of getting any sleep or quality studying done if she stayed there until her exam, which she seemed poised to do. While we were all liable to take our hand off accidentally, there were two of us and one of her, and victory seemed within reach. We had many friends we wanted to celebrate with, and she had her exam to study for, so we offered her $100 and the tip jar contents. Erin told her that it was a win-win, we’d win the contest and spend a warm evening with friends, and she’d walk away with some dough and be able to prepare for her exam. She countered with $130 plus the tip jar, and after some mutual hemming and hawing, we agreed. Her hand came off, and Erin and I remained. Erin and I had previously discussed that if it came down to us, she would take her hand off. She values her privacy, and while she totally wanted free delicious pizza, she did not want to have reporters contacting her and friends/acquaintances bugging her for pizza. As an extrovert, I don’t mind the glamour, fame and paparazzi people inviting themselves to Homeslice with me. This blog has turned into a fun way to practice my writing, photography and social media chops. So she took her hand off, giving both of us exactly what we want. Some have suggested that I should have let her win or she shoulda outlasted me. But we didn’t feel the need to defeat each other. We kissed as she took her hand off, which she then proceeded to rub all over my face. I did the same five seconds later. Pizza is love. Relish Austin – The Statesman’s Addie Brolyes’ foodie blog – she brought me cookies! KEYE CBS 10:00 news – Thanks to Ryan and Jessie for recording these. awww…well, as y’all know it’s not the quantity of comments, it’s the quality of commenters! besides, i think everyone in town, myself included, needed a little break after the HOES contest.